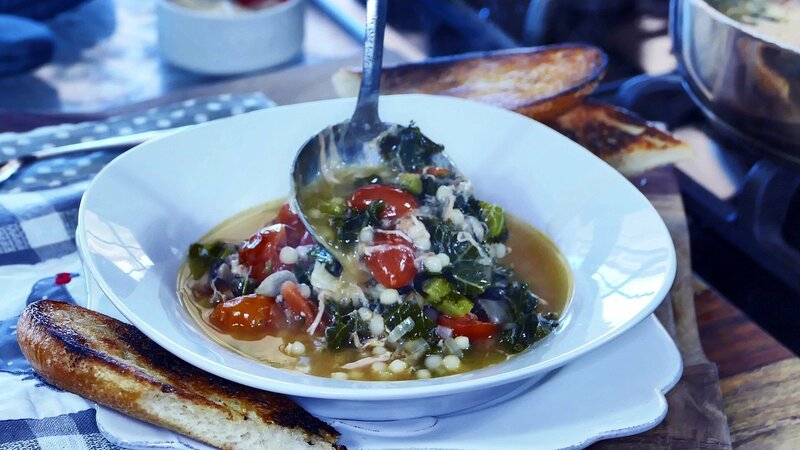 Learn how to make this delicious soup that'll keep you warm this winter! In a medium soup pot, heat olive oil on medium high heat. Sauté onion, garlic and celery until tender. Stir in tomatoes and potato. Add bay leaves and peppercorn and stir to combine. Add chicken broth, mushrooms and either pearl couscous or white beans. Add turkey and kale. Bring to a boil, and then reduce heat to a simmer. Cook for about 15 minutes. (If soup becomes too thick, add more broth or water.) Meanwhile, slice bread and drizzle with olive oil. Place on grill or grill pan to char. When soup is done, season soup with salt and pepper to taste. Sprinkle cheese on bowls of soup and serve with grilled bread.